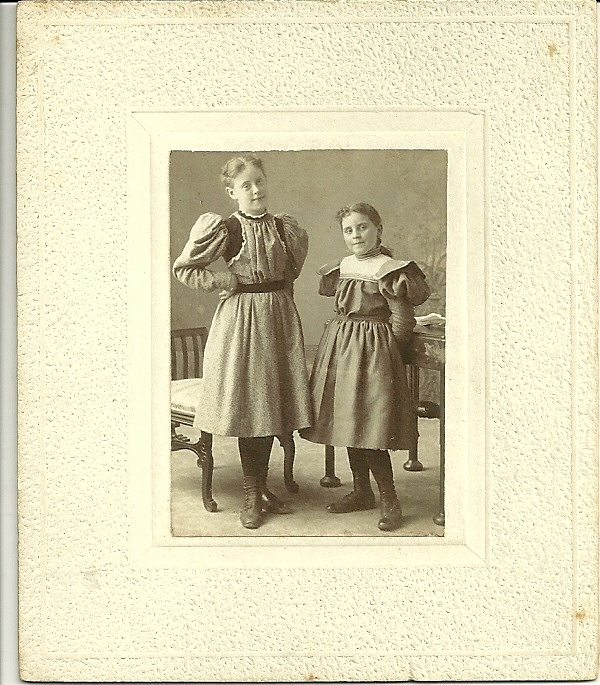 Delightful candid photo of friends Ada Mathewson and Anna Shurtleff. No photographer's mark, but I believe these two girls fit the profile of two girls who lived at Milton, Massachusetts. Interestingly, I found a spelling variation of Shurtlieff online, but in most cases this family is identified as Shurtleff. Look closely at the identification, though, and you'll see that there does seem to be an additional letter in the second syllable. 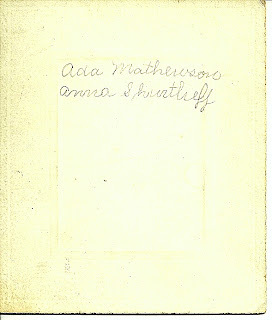 Ada Mathewson was born in July of 1887 in Massachusetts, the daughter of William A. and Celina E. Mathewson of Rhode Island. Her paternal grandparents were Stephen and Harriet W. (Day) Mathewson. I haven't yet found information on the maiden name or parents of Celinda E.
Before the 1920 Census, Ada Mathewson married Maurice Wingate McQuesten, who was born 13 August 1894 at Reading, Massachusetts, the son of Frank Jones McQuesten and his first wife Marie Antoinette (Kirkpatrick) McQuesten, born in New Hampshire and, possibly, Philadelphia respectively. Ada and Maurice were living at Saugus, Massachusetts at the time of the 1930 Census; there were no children living with them. Whether they had lost any children or had children later, I don't know. Anna Shurtleff was born 7 February 1888 at Milford, Massachusetts, the daughter of John Gleason Shurtleff and wife Lilla Van Ness (Woodbury) Shurtleff, both born in Massachusetts. Her paternal grandparents were Hammond G. and Mary Eliza (Sanderson) Shurtleff. Her maternal grandparents were George S. and Eliza Ann (Hill) Woodbury of Massachusetts. Sometime before the 1920 Census, Anna Shurtleff married Walter Blaine McFarland, who was born 12 August 1887 at South Framingham, Massachusetts. I don't yet have information on his parents. 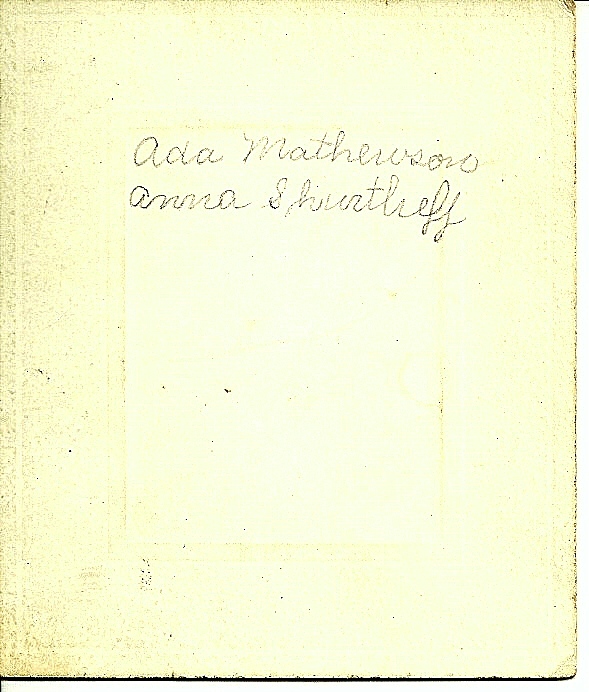 In the 1920 and 1930 Censuses of Milford, Massachusetts, Anna and Walter were living with Anna's parents. There were no children listed with them. If you have any corrections, additions or insights regarding any of the people described above, please leave a comment or contact me directly. I love what you're doing here. A wonderful, kind service. Definitely not a business model I'd recommend - but sure is fun! Wonderful! If you notice errors in the text, please let me know so I can correct them.